Information on the 2018/2019 Influenza vaccine is available on the Ministry of Health and Long Term-Care website. Public Health Ontario has released a document on Influenza Vaccines for Children and Older Adults for the 2018/2019 Influenza season. The Outbreak Status Report is updated weekly on Thursday, providing health care providers and our community with a snapshot of possible viruses or other pathogens circulating in our communities. Public Health Notes are published annually highlighting key areas of public health concern as they relate to infectious diseases and infection control. Vaccine Recall in China: Two batches of DTaP vaccine were recalled by China Food and Drug Administration (CFDA) on October 29, 2017 after failing potency testing. For more information on management of children who may have been vaccinated in China. Renfrew County and District Health Unit is designated as a Baby Friendly Community Health Service under the Baby Friendly Initiative (BFI). Renfrew County and District Health Unit’s Client-Friendly Breastfeeding Policy. The Health Unit`s full Breastfeeding Policy is available upon request. Email familyhealth@rcdhu.com. BFI requires the Health Unit to monitor breastfeeding rates and trends in the community. See Infant Feeding in Renfrew County and District (PDF 30 pages) or the Executive Summary (PDF 4 pages) for the findings from our first two years of infant feeding surveillance. For a centralized source of quality, evidence-informed resources that support the Baby-Friendly Initiative see Breastfeeding Resources Ontario. Falls are a serious health issue for older adults, their families and the health care system. The course is based on current research, the Canadian Fall Prevention Curriculum, and what has been shown in practice to prevent falls. Be aware of local fall prevention services and resources. Set up an account to access online courses at Ottawa Public Health. See Steps to Accessing External eLearning (ulearn) for further instructions. Please complete the fluid survey at the end of the module to help us improve our service. The Personal Support Worker Fall Prevention Training module was developed collaboratively by Renfrew County and District Health Unit and the three other public health units in the Champlain LHIN region. Ottawa Public Health has adapted this as an online module. Healthy Babies Healthy Children is a voluntary, free home visiting program for women and their families in the prenatal period, and women with children from birth until their transition to school. Healthy Babies Healthy Children offers support in the home for every child and parent identified with challenges. This includes assessment, teaching, referral and service coordination. Staff work with clients on achieving healthy pregnancy, good nutrition and feeding (including breastfeeding), healthy child development, safety, adjusting to parenthood, accessing community resources and more. Renfrew County and District Health Unit’s home visiting team consists of Registered Nurses and Home Visitors. Renfrew County and District Health Unit offers immunization services to people of all ages living in Renfrew County and District. Please see the new RCDHU Immunization Clinic Schedule. Routine vaccines are publicly funded. Routine publicly funded vaccine will now be available the 1st and 3rd weeks of each month. Publicly funded vaccine orders should be faxed at 613-735-3067 Attn: Vaccine Orders or emailed to Renfrew County and District Health Unit at vaccineorders@www.rcdhu.com. All orders must be placed by 4:00 pm on the Thursday prior to the 1st and 3rd week of each month to allow for processing and availability. The vaccines will be available to Health Care Providers beginning on Wednesday at your nearest RCDHU office location. This does not include Influenza vaccine (schedule available in the Fall) or high risk vaccines. The High Risk Vaccine order form is a specific form which can be received by contacting 613-735-8653 ext: 582. These vaccines will be processed in a timely fashion based on availability. Please ensure that you order adequate vaccine supply for your needs based upon the vaccine ordering schedule. Vaccines are highly temperature and light sensitive. They must be maintained and stored between +2°C to +8°C, and protected from sunlight and florescent light at all times in order to be potent on administration. Do not transport vaccines in the trunk of a car. An insulated vaccine cooler with ice packs and thermometer, as demonstrated below, are required to pick up the vaccines from RCDHU for transportation. For further detailed information see link below. Vaccines must be kept between 2°C to 8°C to ensure the vaccines stay potent and effective. When the vaccine storage refrigerator varies above or below these temperatures, this is known as a cold chain incident and must be immediately reported to the Renfrew County and District Health Unit by calling 613-735-8653. A Public Health Nurse will provide instructions and investigate the cold chain break to determine the best follow up actions. Please complete the form below for all of the expired and/or exposed vaccines. All vaccines must be accompanied with the form when submitting to the Health Unit. To be exempted from immunization requirements for attending school, either a statement of conscience or religious belief affidavit must be completed, or have a statement of medical exemption completed by a doctor or nurse practitioner. As of September 1, 2017 parents who are choosing to complete a statement of conscious or religious belief affidavit must complete a mandatory education session provided by Renfrew County and District Health Unit. For more information please call 613-735-8653 ext 513. NOTE: If providing a statement of conscience or religious belief affidavit, it must be signed by a qualified commissioner. To report an adverse event following immunization, please complete the Report of an Adverse Event Following Immunization, and fax to 613-735-3067. Renfrew County and District Health Unit works with hospitals, long-term care homes, day nurseries and other community settings to ensure infection control programs are in place where required and that infection prevention practices are followed. Health Unit staff participate in the infection control committees of hospitals and long-term care homes in Renfrew County and District. Flu shots are available free for all Ontario residents over six months of age. They are available through local drug stores, health care providers, and Renfrew County and District Health Unit. Many people with influenza-like illness do not seek medical care or have lab testing done. Therefore reporting of laboratory confirmed influenza cases to public health units significantly underestimates the burden of influenza in Ontario. For information on the number of lab confirmed influenza cases in Renfrew County and District, see the Local Influenza Activity section of our Weekly Outbreak Status Reports. An influenza pandemic is declared when a new strain of flu virus emerges that has never been seen before and begins to spread quickly around the world. For example, in Spring 2009, a new strain of the influenza virus, the H1N1 virus, caused a pandemic. As it was a new strain and because humans had little to no natural immunity to this virus, it caused serious and widespread illness. Under the Ontario Health Protection and Promotion Act, outbreaks of respiratory and enteric infections in institutions are reportable to the local Medical Officer of Health on the same day as the outbreak is suspected or confirmed. When an outbreak is reported to the Health Unit, a Public Health Nurse (for respiratory outbreaks) or a Public Health Inspector (for enteric outbreaks) offers to assist staff at the facility in their efforts to prevent the spread of the illness. The Outbreak Management Guide contains all relevant information to assist facilities in fulfilling their duties to report and in managing an enteric or respiratory outbreak, as per ministry standards and guidelines. Ontario Respiratory Pathogen Bulletin is posted every Friday during influenza season (November to April). Public Health Inspectors investigate animal bites and scratches that are reported to the Health Unit. The owner has to put the suspect animal into quarantine. This is necessary to ensure that the rabies virus was not present in the saliva of the animal when the person was bitten or scratched. The animal is checked at the end of the quarantine period to make sure it is free of rabies symptoms. All animal bites and scratches involving humans must be reported to the Health Unit immediately using the Contact with Suspected Rabid Animal Report Form. If a person exposed requires rabies post-exposure prophylaxis, fill in the Request for Rabies Post Exposure Vaccine Form and report it to the Health Unit immediately. Supports for your patients to quit smoking are available through a variety of programs and services in Renfrew County and District. The following resources are can assist health care providers to support patients with cutting back or quitting tobacco. You Can Make It Happen – A resource for health care providers to assist their patients and clients to quit smoking. TEACH – Training Enhancement in Applied Cessation Counselling and Health – A training program to ensure that practitioners who provide services to people who use tobacco have the knowledge and skills to deliver effective, evidence-based cessation interventions. Tobacco Free RNAO – A resource for Registered Nurses in Ontario to integrate smoking cessation into daily nursing practice. Ottawa Model for Smoking Cessation – A program that systematically identifies, provides treatment, and offers follow-up to all smokers seen in clinical practice. The inpatient part of this program is implemented by hospitals in Renfrew County. The Ontario Health Protection and Promotion Act lists over 70 communicable diseases that must be reported to local health units. Physicians and other practitioners, administrators of hospitals, superintendents of institutions, and school principals are responsible for reporting to the local Health Unit. All reports are followed up by a Public Health Nurse or Public Health Inspector. For diseases that need to be reported immediately, call 613-735-8653 during office hours, and 613-735-9926 during evenings, weekends and holidays. For all reportable diseases, complete the appropriate reporting form and fax to 613-735-3067 by the next business day. PLEASE NOTE: Respiratory and gastroenteritis outbreaks in institutions should be reported immediately by telephone when an outbreak is suspected or confirmed. See Outbreak Management for forms and resources to use during an outbreak. We all hold certain beliefs about what health is and what makes us healthy or sick. We often think of health in terms of whether we have medical care or make healthy choices. What does health mean to you? Access to medical care and the choices we make are important to our health but our health is significantly affected by the choices available to us. Not all people living in Renfrew County and District have the same opportunity to make choices that allow them to live a long and healthy life. But why was he playing in an junk yard? Residents in Renfrew County and District should have the opportunity to make healthy choices regardless of their income, education or culture. Canadian research shows that people with lower incomes, limited education, poor living/working conditions, and no meaningful connection with their community have poorer health. Health starts in the communities of Renfrew County – where we live, learn, work, and play. An estimated half of all illness is caused by life circumstances such as income, education, employment, social connections, early childhood experiences, food, housing, race and gender. About 15 percent of illness is caused by our biology and genetics. About 10 percent of illness is caused by things in our environment such as air quality and civic infrastructure. About 25 percent of illness is related to quality of health care and access to health services. What Determines Health? – Learn more about the determinants of health from the Public Health Agency of Canada. What are the Social Determinants of Health? – A description of the social determinants of health and useful resources for public health practitioners and organizations. Let’s Start a Conversation About Health…and Not Talk About Health Care at All (Video) – Learn more about the social determinants of health through a video created by Sudbury & District Health Unit. 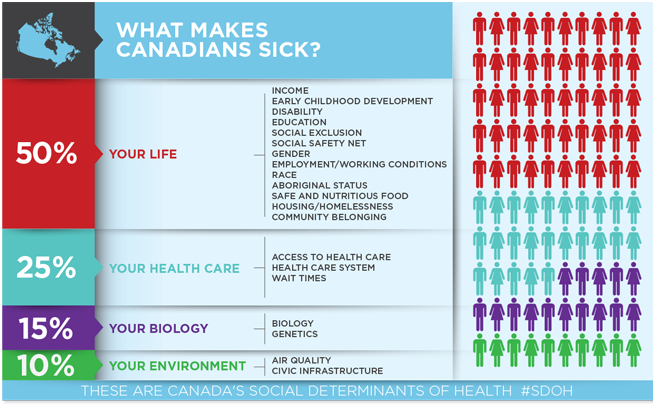 Social Determinants of Health: The Canadian Facts – A book by Dennis Raphael and Juha Mikkonen on the social determinants of health, why they are important, and what we can do to improve them. Health Equity – Resources and reports on health equity from Public Health Ontario. Reducing Health Inequalities: A Challenge for Our Times – An overview of health inequalities in Canada and the Public Health Agency of Canada’s actions on these health inequalities. Primary Care Interventions into Poverty – Access clinical tools developed to assist primary care providers in addressing poverty. Some people in Renfrew County and District are less healthy and live shorter lives, not because of personal choice, but because of the circumstances in which they live. When differences in health are systematic, avoidable and unfair and have the potential to be changed or decreased by social action, they are called health inequities. See the report on Health Inequities in Renfrew County and District Report, 2018 to learn more. For an overview of the report, see the Report Summary – Health Inequities in Renfrew County and District Report, 2018.